Synthetic peptide corresponding to Aequorea victoria GFP (N terminal) conjugated to keyhole limpet haemocyanin. HEK293 cells transfected with GFP-tagged protein vector. ab127417 is stable for one year when stored properly. Our Abpromise guarantee covers the use of ab127417 in the following tested applications. WB 1/1000 - 1/3000. Predicted molecular weight: 27 kDa. We have not specifically tested d1/d2EGFP but beleive that ab127417 will be able to detect this. 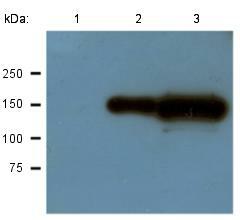 We also recommend using out anti-EGFP antibody ab111258 as we have been informed that this will work as well.